The term fast Fourier transform (FFT) refers to an efficient implementation of the discrete Fourier transform (DFT) for highly compositeA.1 transform lengths . When computing the DFT as a set of inner products of length each, the computational complexity is . When is an integer power of 2, a Cooley-Tukey FFT algorithm delivers complexity , where denotes the log-base-2 of , and means ``on the order of ''. Such FFT algorithms were evidently first used by Gauss in 1805  and rediscovered in the 1960s by Cooley and Tukey . Pointers to FFT software are given in §A.7. Two basic varieties of Cooley-Tukey FFT are decimation in time (DIT) and its Fourier dual, decimation in frequency (DIF). The next section illustrates decimation in time. When is a power of , say where is an integer, then the above DIT decomposition can be performed times, until each DFT is length . A length DFT requires no multiplies. The overall result is called a radix 2 FFT. A different radix 2 FFT is derived by performing decimation in frequency. A split radix FFT is theoretically more efficient than a pure radix 2 algorithm [73,31] because it minimizes real arithmetic operations. The term ``split radix'' refers to a DIT decomposition that combines portions of one radix 2 and two radix 4 FFTs .A.3On modern general-purpose processors, however, computation time is often not minimized by minimizing the arithmetic operation count (see §A.7 below). Recall (e.g., from Eq. (6.1)) that the inverse DFT requires a division by that the forward DFT does not. In fixed-point arithmetic (Appendix G), and when is a power of 2, dividing by may be carried out by right-shifting places in the binary word. Fixed-point implementations of the inverse Fast Fourier Transforms (FFT) (Appendix A) typically right-shift one place after each Butterfly stage. However, superior overall numerical performance may be obtained by right-shifting after every other butterfly stage , which corresponds to dividing both the forward and inverse FFT by (i.e., is implemented by half as many right shifts as dividing by ). Thus, in fixed-point, numerical performance can be improved, no extra work is required, and the normalization work (right-shifting) is spread equally between the forward and reverse transform, instead of concentrating all right-shifts in the inverse transform. The NDFT is therefore quite attractive for fixed-point implementations. Because signal amplitude can grow by a factor of 2 from one butterfly stage to the next, an extra guard bit is needed for each pair of subsequent NDFT butterfly stages. Also note that if the DFT length is not a power of , the number of right-shifts in the forward and reverse transform must differ by one (because is odd instead of even). As discussed above, a mixed-radix Cooley Tukey FFT can be used to implement a length DFT using DFTs of length . However, for factors of that are mutually prime (such as and for ), a more efficient prime factor algorithm (PFA), also called the Good-Thomas FFT algorithm, can be used [26,80,35,43,10,83].A.4 The Chinese Remainder Theorem is used to re-index either the input or output samples for the PFA.A.5Since the PFA is only applicable to mutually prime factors of , it is ideally combined with a mixed-radix Cooley-Tukey FFT, which works for any integer factors. It is interesting to note that the PFA actually predates the Cooley-Tukey FFT paper of 1965 , with Good's 1958 work on the PFA being cited in that paper . The PFA and Winograd transform  are closely related, with the PFA being somewhat faster . Like Rader's FFT, Bluestein's FFT algorithm (also known as the chirp -transform algorithm), can be used to compute prime-length DFTs in operations [24, pp. 213-215].A.6 However, unlike Rader's FFT, Bluestein's algorithm is not restricted to prime lengths, and it can compute other kinds of transforms, as discussed further below. where the ranges of given are those actually required by the convolution sum above. Beyond these required minimum ranges for , the sequences may be extended by zeros. As a result, we may implement this convolution (which is cyclic for even and ``negacyclic'' for odd ) using zero-padding and a larger cyclic convolution, as mentioned in §7.2.4. In particular, the larger cyclic convolution size may be chosen a power of 2, which need not be larger than . Within this larger cyclic convolution, the negative- indexes map to in the usual way. Note that the sequence above consists of the original data sequence multiplied by a signal which can be interpreted as a sampled complex sinusoid with instantaneous normalized radian frequency , i.e., an instantaneous frequency that increases linearly with time. Such signals are called chirp signals. For this reason, Bluestein's algorithm is also called the chirp -transform algorithm . In summary, Bluestein's FFT algorithm provides complexity for any positive integer DFT-length whatsoever, even when is prime. Other adaptations of the Bluestein FFT algorithm can be used to compute a contiguous subset of DFT frequency samples (any uniformly spaced set of samples along the unit circle), with complexity. It can similarly compute samples of the transform along a sampled spiral of the form , where is any complex number, and , again with complexity . An exception is when processing exactly periodic signals where the period is known to be an exact integer number of samples in length.A.8 In such a case, the DFT of one period of the waveform can be interpreted as a Fourier series (§B.3) of the periodic waveform, and unlike virtually all other practical spectrum analysis scenarios, spectral interpolation is not needed (or wanted). In the exactly periodic case, the spectrum is truly zero between adjacent harmonic frequencies, and the DFT of one period provides spectral samples only at the harmonic frequencies. Adaptive FFT software (see §A.7 below) will choose the fastest algorithm available for any desired DFT length. Due to modern processor architectures, execution time is not normally minimized by minimizing arithmetic complexity . There are alternatives to the Cooley-Tukey FFT which can serve the same or related purposes and which can have advantages in certain situations . Examples include the fast discrete cosine transform (DCT) , discrete Hartley transform , and number theoretic transform . The DCT, used extensively in image coding, is described in §A.6.1 below. The Hartley transform, optimized for processing real signals, does not appear to have any advantages over a ``pruned real-only FFT'' . 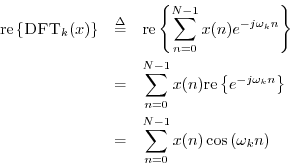 The number theoretic transform has special applicability for large-scale, high-precision calculations (§A.6.2 below). Note that is the DFT frequency for a length DFT (as opposed to ). Thus, the real part of a double-length FFT is the same as the DCT except for the half-sample phase shift in the sinusoidal basis functions (and a scaling by 2 which is unimportant). In practice, the DCT is normally implemented using the same basic efficiency techniques as in FFT algorithms. In Matlab and Octave (Octave-Forge), the functions dct and dct2 are available for the 1D and 2D cases, respectively. where denotes the length DFT of . The number theoretic transform is based on generalizing the th primitive root of unity (see §3.12) to a ``quotient ring'' instead of the usual field of complex numbers. Let denote a primitive th root of unity. We have been using in the field of complex numbers, and it of course satisfies , making it a root of unity; it also has the property that visits all of the ``DFT frequency points'' on the unit circle in the plane, as goes from 0 to . When the number of elements in the transform is composite, a ``fast number theoretic transform'' may be constructed in the same manner as a fast Fourier transform is constructed from the DFT, or as the prime factor algorithm (or Winograd transform) is constructed for products of small mutually prime factors . Unlike the DFT, the number theoretic transform does not transform to a meaningful ``frequency domain''. However, it has analogous theorems, such as the convolution theorem, enabling it to be used for fast convolutions and correlations like the various FFT algorithms. An interesting feature of the number theory transform is that all computations are exact (integer multiplication and addition modulo a prime integer). There is no round-off error. This feature has been used to do fast convolutions to multiply extremely large numbers, such as are needed when computing to millions of digits of precision. For those of us in signal processing research, the built-in fft function in Matlab (or Octave) is what we use almost all the time. It is adaptive in that it will choose the best algorithm available for the desired transform size. For C or C++ applications, there are several highly optimized FFT variants in the FFTW package (``Fastest Fourier Transform in the West'') . FFTW is free for non-commercial or free-software applications under the terms of the GNU General Public License. 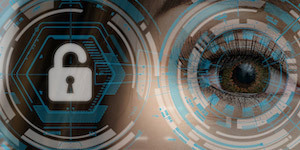 For embedded DSP applications (software running on special purpose DSP chips), consult your vendor's software libraries and support website for FFT algorithms written in optimized assembly language for your DSP hardware platform. Nearly all DSP chip vendors supply free FFT software (and other signal processing utilities) as a way of promoting their hardware. 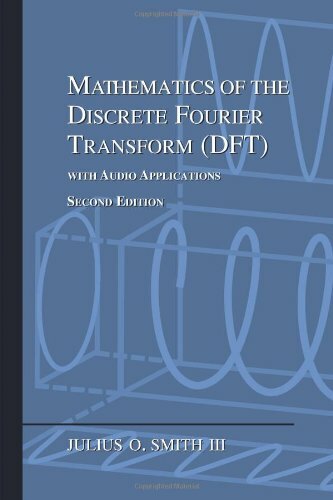 Detailed derivation of the Discrete Fourier Transform (DFT) and its associated mathematics, including elementary audio signal processing applications and matlab programming examples.